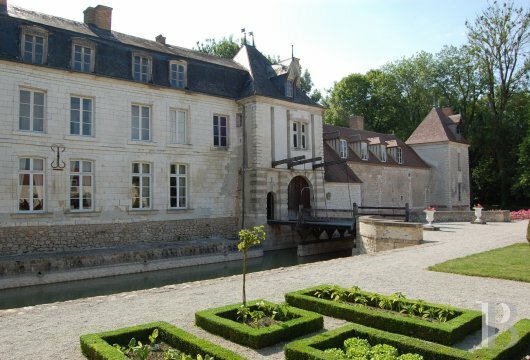 A 16th & 18th century, listed, fully restored castle with its double drawbridge, unique in France - chateaux for sale France - in Picardy, Nord-pas-de-calais, Lille, Champagne-Ardenne, Lorraine, Alsace and Franche-Comte region - Patrice Besse Castles and Mansions of France is a Paris based real-estate agency specialised in the sale of Castles / chateaux. In the French department of Aube (10) in the Champagne-Ardenne region, some 150 km to the south-east of Paris and 25 km to the north of Troyes. 20 minutes from an SNCF railway station with 70-minute train links to Paris. 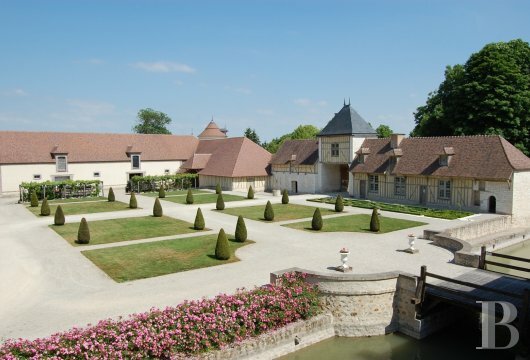 The castle stands on the outskirts of a small, quiet village in the heart of the Champagne countryside. 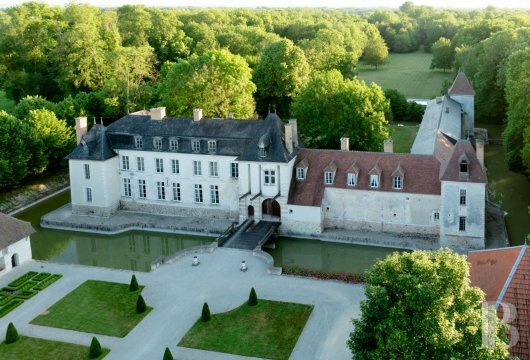 Shared in the Middle-Ages between several owners, including the Counts of Champagne, succeeded by the kings of France and Montier-la-Celle Abbey, the Seigneury was reunited in the 15th century and became the property of the Canons of Vincennes. 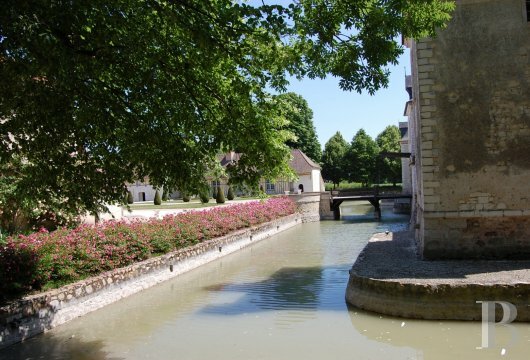 In 1581 an exchange contract was agreed between the Canons of Vincennes and a burgher from Troyes who became the owner of the premises. 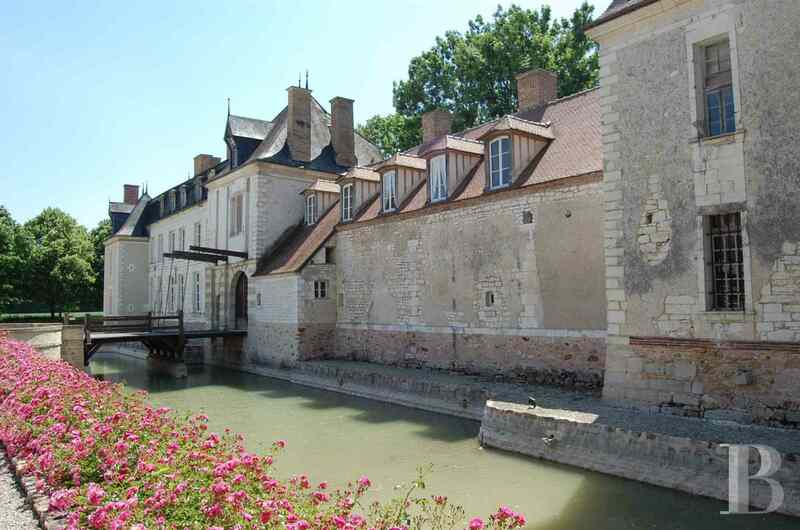 In 1586, the “future lord of the premises” obtained from King Henri III letters patent authorising him to surround his residence with walls and moats with a drawbridge, thus “protecting it from thieves and vagabonds”. 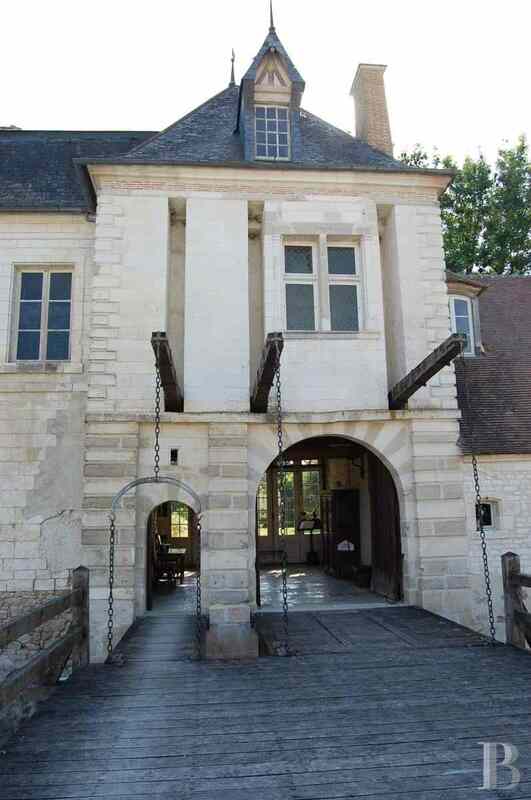 The postern, the gatehouse buildings, the miniature castle entrance with its drawbridge, the three corner towers, all the outside walls of the servants’ quarters as well as the double, circular moats are still remaining from this period. Under the reign of Henri IV (King of France and of Navarre from 1589 to 1610), the Catholic League opposed the “Protestant” king, thus threatening his authority in numerous towns of France, including Troyes. The loyalty of the owner of the premises to his king enabled him to obtain from his sovereign, in 1598, a letter confirming the exchange of 1581 in consideration for “good and loyal service that the mayor rendered to us by bringing our town of Troyes back into line”, endowing him with the title of “Seigneur”. 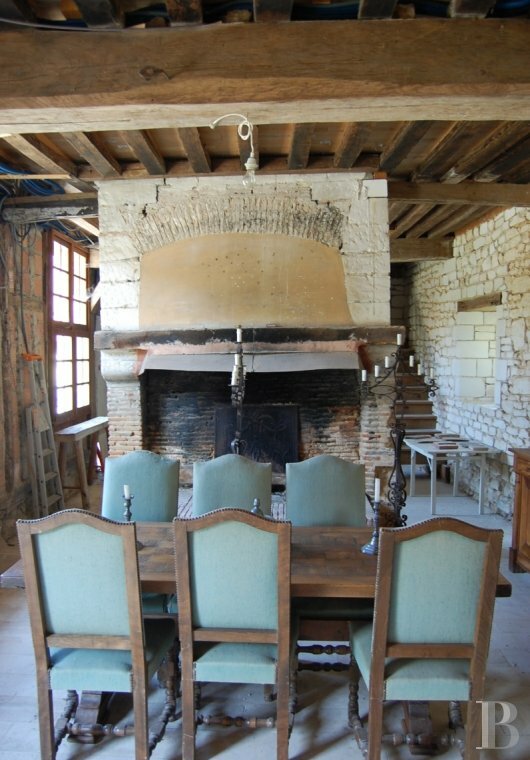 In 1602 the Seigneury was handed down to his son and then his grandson, Advisor to the French Grand Council, followed by State Councillor. His heirs sold the Seigneury in 1712, to the royal equerry, secretary to the king, Controller General of the Grand Chancellery. 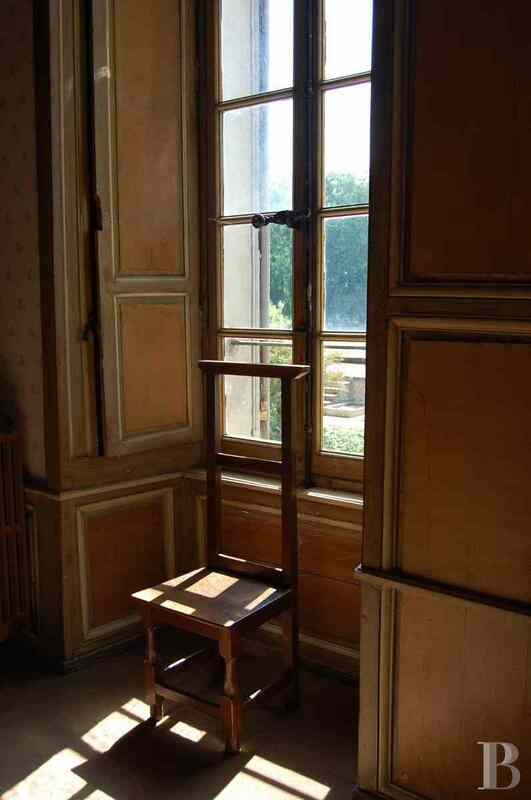 In 1743, the Advisor to the Taxation Court in Paris, then Seigneur of the premises, undertook major works. He had the facade of the actual main building modified and redesigned the facades and roofs of the servants’ quarters on the garden side, transforming the old fortress into a chateau. 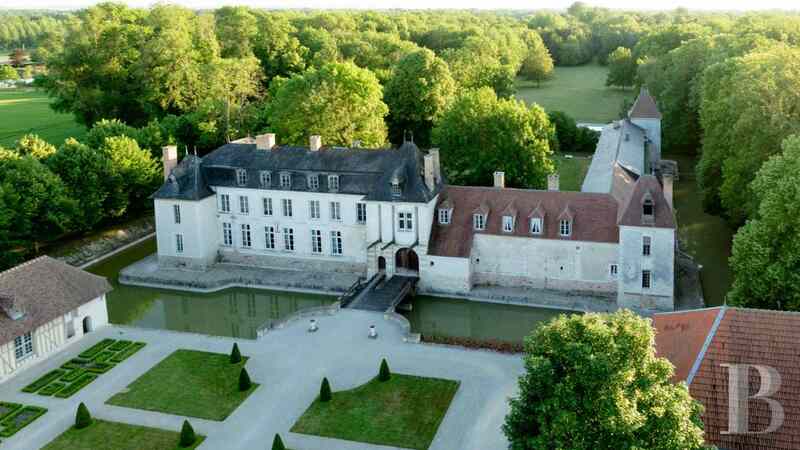 During the French Revolution, the owner of the premises, finally struck off the list of emigrants, managed to recuperate the castle which then remained in the same family until the death of the last marchioness in 1974. 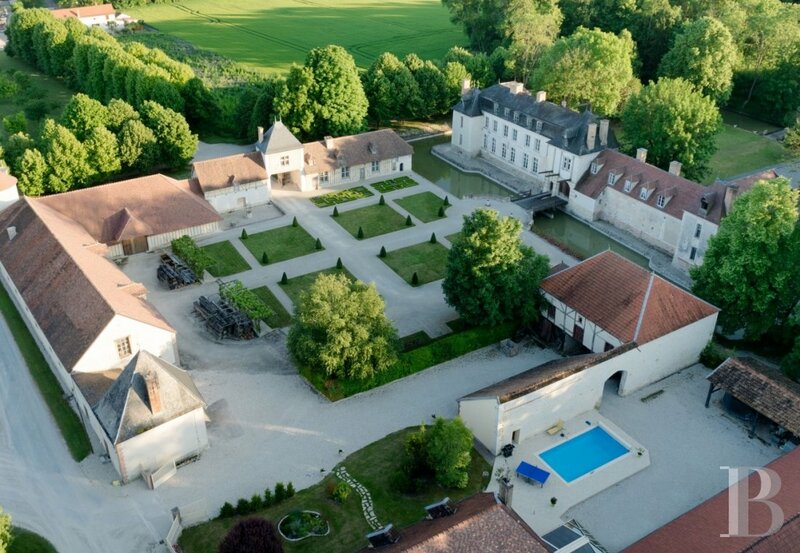 The chateau was much neglected until 1983, when it was acquired by its current owners who have meticulously and passionately revived its noble appearance. 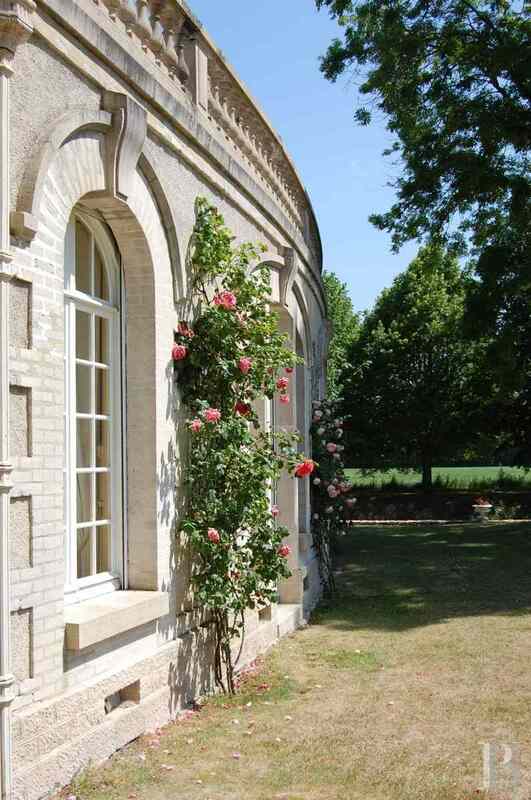 After the lime-tree-lined alleyway and the orchard comes the dovecote as well as the fortified-looking, 16th century entrance postern which opens into the outer bailey, with its Medieval vegetable garden and French formal garden. It is partially surrounded by the servants’ quarters that bear witness to the Champagne origins of the castle with its half-timbering and its cob. The castle, reflected in the water-filled moats surrounding it, stands in line. Featuring disparate architecture, it nevertheless displays remarkable harmony. The entrance postern, the corner towers as well as the right wing of the castle date from the 16th century. 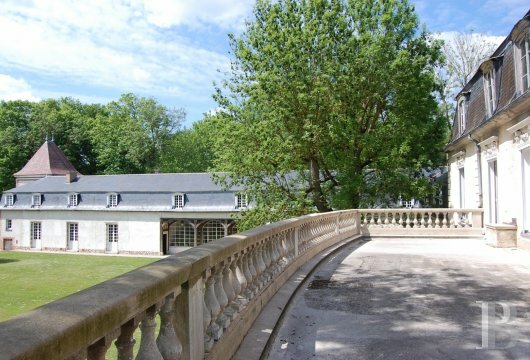 The main limestone building was built in the 18th century on the site of the old wing of the initial castle. The entrance postern, accessed via the double wooden drawbridge which is operated manually, opens into the main courtyard, partially surrounded by buildings laid out in a square, the corners of which feature the four 16th century, gun-loop towers, including one that has been levelled off, making way for a terrace. They bear witness to the original castle layout. 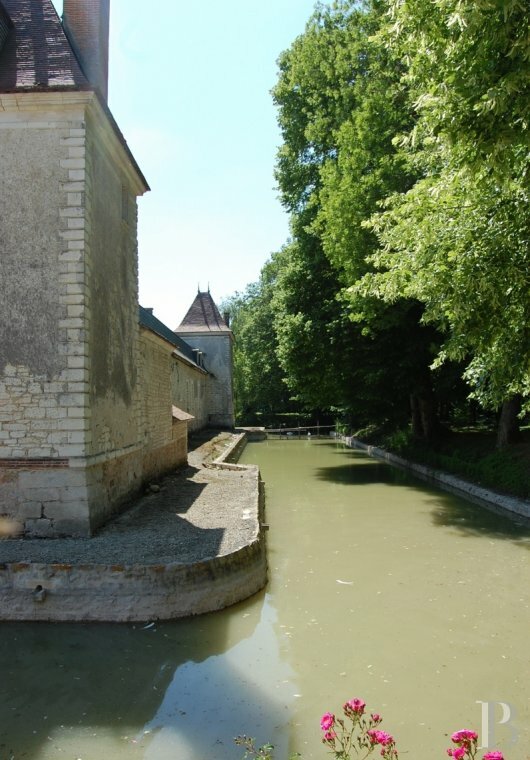 The buildings are surrounded by a first enclosure formed by water-filled moats. 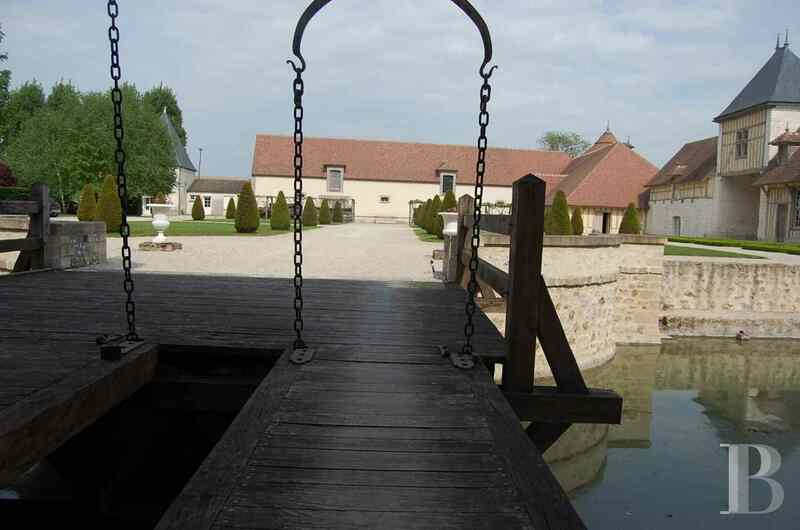 A wooden bridge provides access to the parklands which are set out around a central axis. A few tree trunks bear witness to the old alleyway of one hundred year old plane trees, that is no longer in existence. 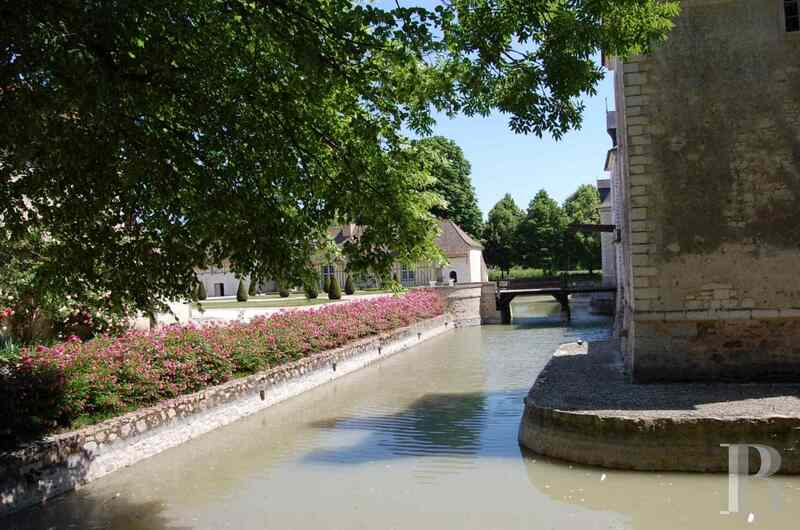 The view takes in the outer moat which surrounds the entire parklands spanning approx. 8,000 m². 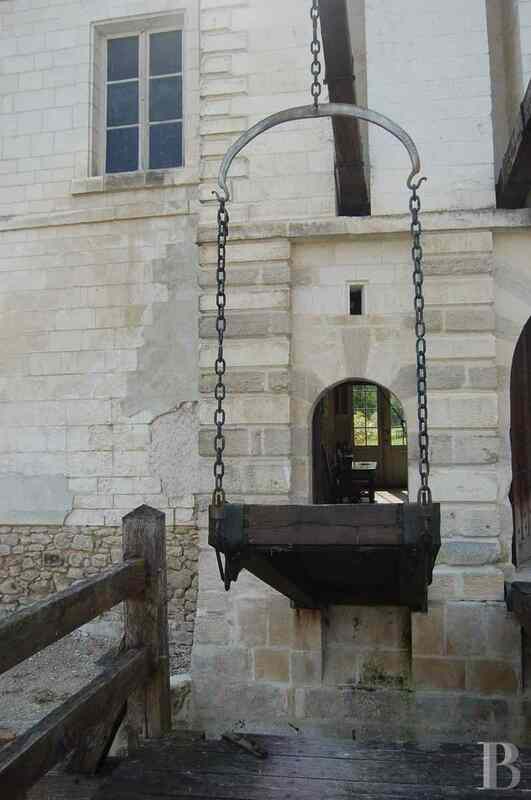 The castle is accessed via the central entrance postern, dating from the 16th century, reached via the double drawbridge with its spars and chains. It spans three levels. 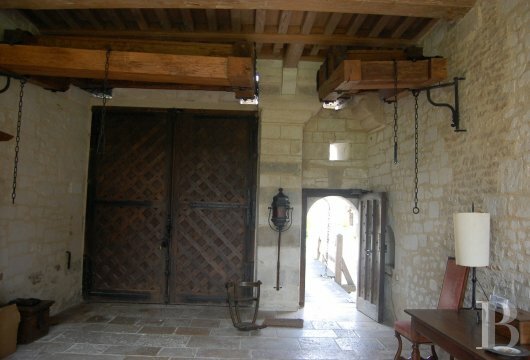 The ground floor features the large porch way closed by the tall wooden door, studded on both sides as well as by the postern on the left-hand side, flanked by continuous rustic masonry. The main door is topped with a stone mullioned, stained glass window, flanked by the holes for receiving the spars of the double drawbridge. The hip slate roof features a central shed dormer with two zinc finials. On either side are the two wings of the main facade, at the ends of which stand a square 16th century tower with gun-loops. The main limestone building was constructed as of 1714. It spans three levels and is topped with a slate Mansard roof featuring zinc decks and breaks with five windows. The roof is in need of restoration works. At the end of the main building protrudes the old, fully restored, square tower, covered with a slate roof featuring a shed dormer. The right-hand wing still has its original architecture. It spans two levels, topped with a flat tile, gable roof, featuring five roof dormers with overhanging eaves. On the corner stands the old square tower, from which the north-west wing extends at right angles. 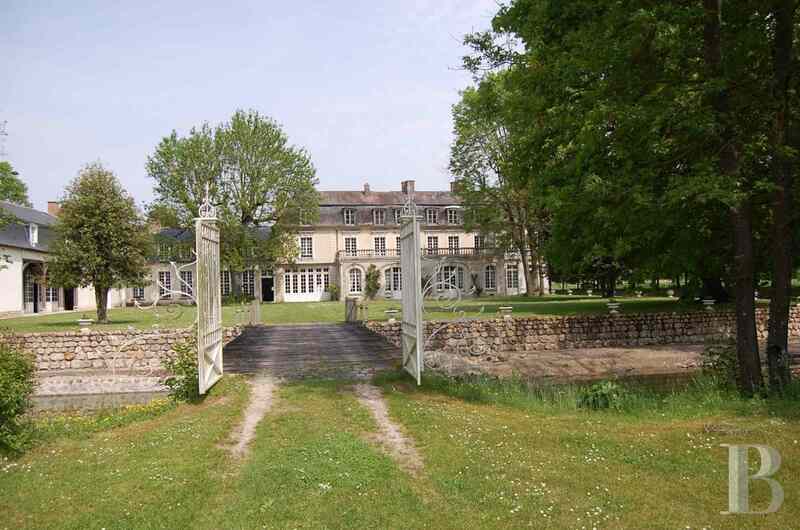 It houses the old stables and the former “charetterie” where carriages were kept. At the end stands a third tower known as the “Marchioness’ pavilion”. The roofs on the 16th century section are covered with terracotta tiles. In 1900, a gallery with an air of a conservatory was added to the ground floor of the 18th century section on the main courtyard side. 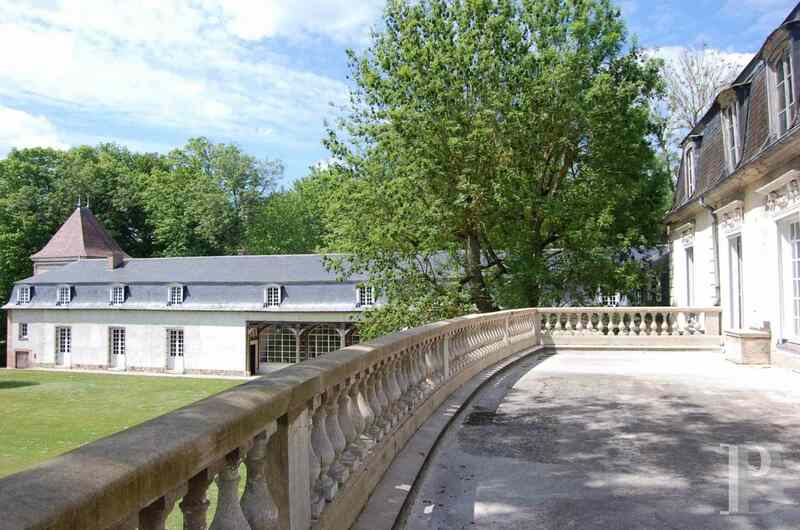 It was topped with a terrace bordered by a stone balustrade that can be reached from upstairs. Standing facing the outer bailey, it is set out around the miniature castle entrance. 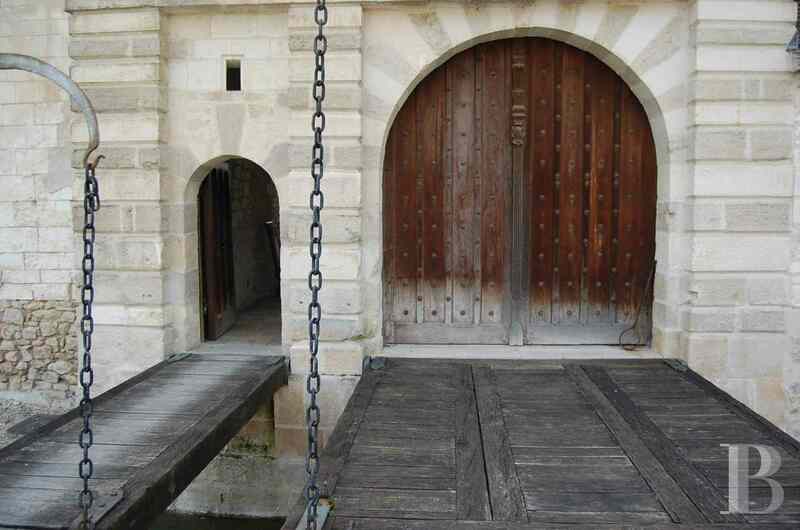 The ground floor opens into a closed gallery which contains the mechanism for the drawbridge. 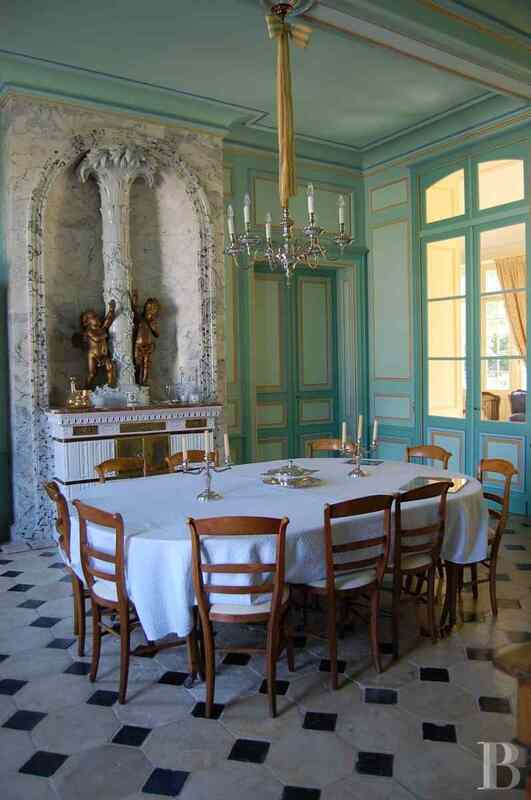 The exposed stone walls are topped with a French ceiling featuring sand-blasted wood. The floor is composed of flagstones. 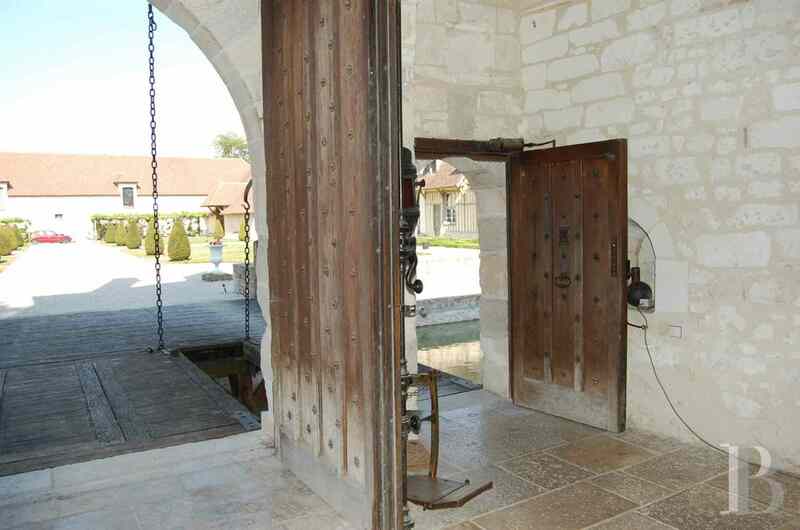 A large, small-paned, glazed door opens into the castle’s inner courtyard. 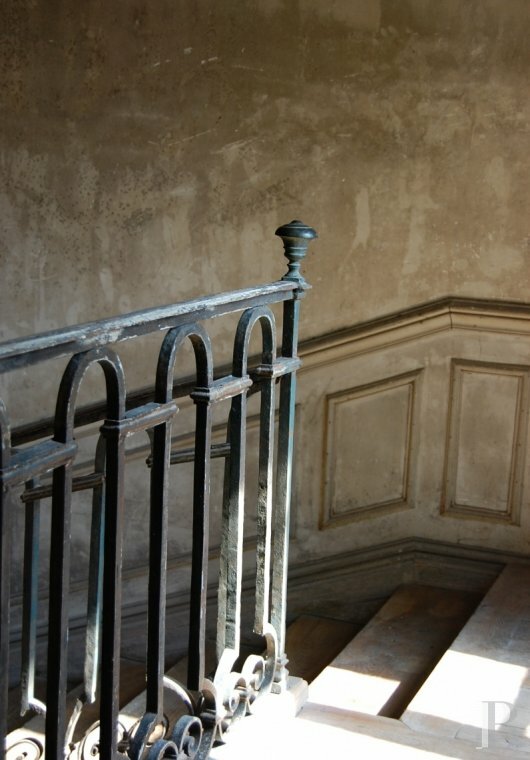 On the left-hand side is the vestibule in the 18th century section, which houses a two-flight, wooden stairway with wrought iron railings. Its tiled floor has black inlaid decoration. Under the stairway is a wardrobe with a wooden door. 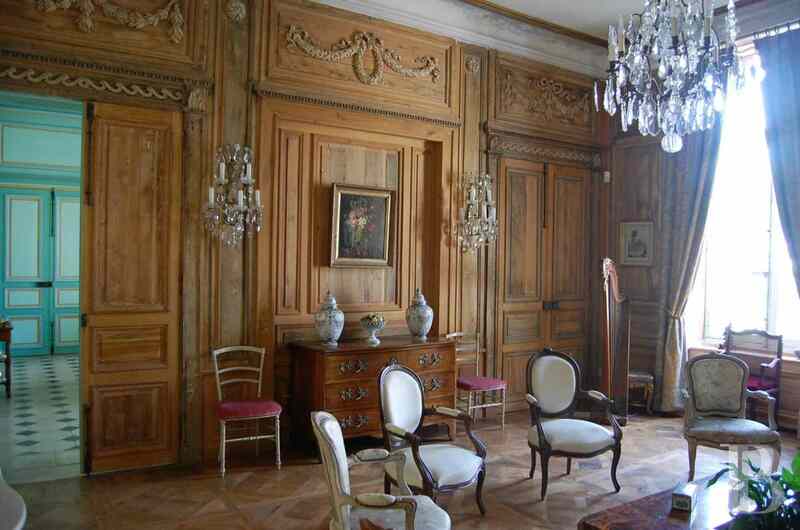 This is followed by double wooden doors leading to a fully restored, 18th century dining room, decorated with painted panelling. 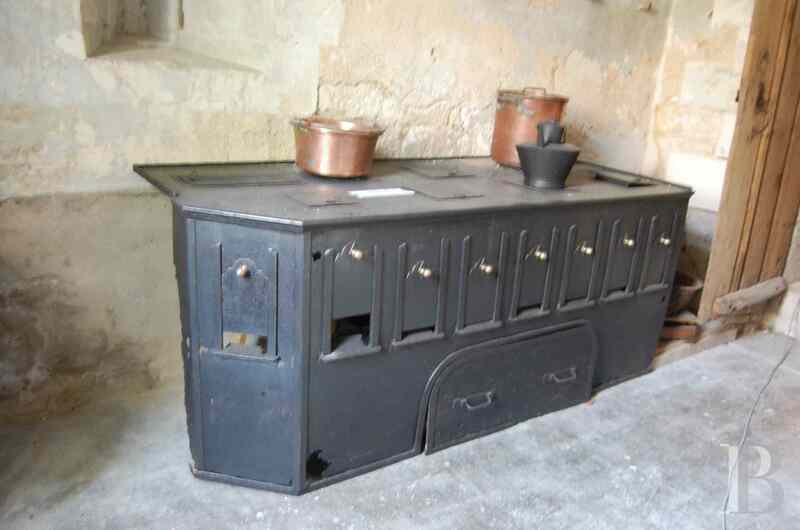 An impressive Dutch ceramic wood-burning stove, also used as a serving area, nestles in an alcove, painted black and white to resemble marble. The Rococo-style flue, representing a palm tree, is adorned with a cherub and a small bronze gilt girl. The floor features white flagstones with black inlaid decoration. A concealed door provides access to a narrow stairway leading to the boiler room. The radiators have been hidden behind the wooden lower sections. The wooden indoor shutters have been fully restored. 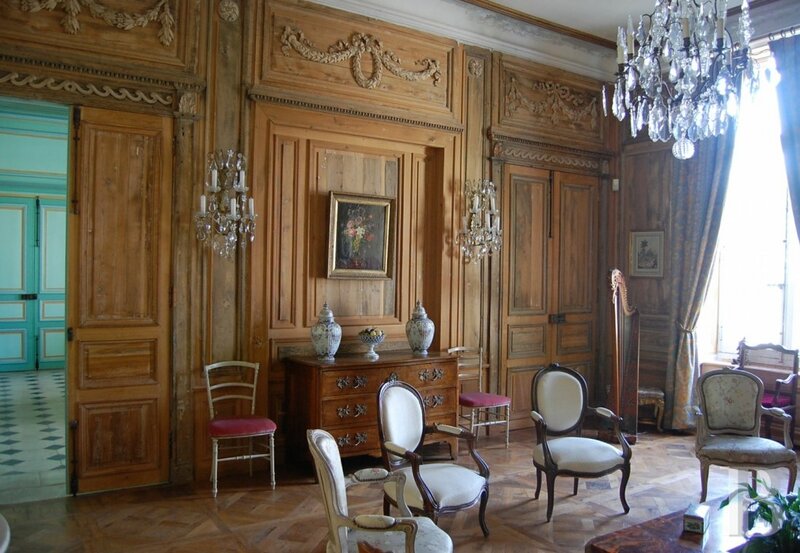 After the dining room, double wooden doors lead to a large lounge adorned with fully restored, floor-to-ceiling panelling, richly decorated with carved flower garlands, evolute spiral bands, godroons and rosettes. 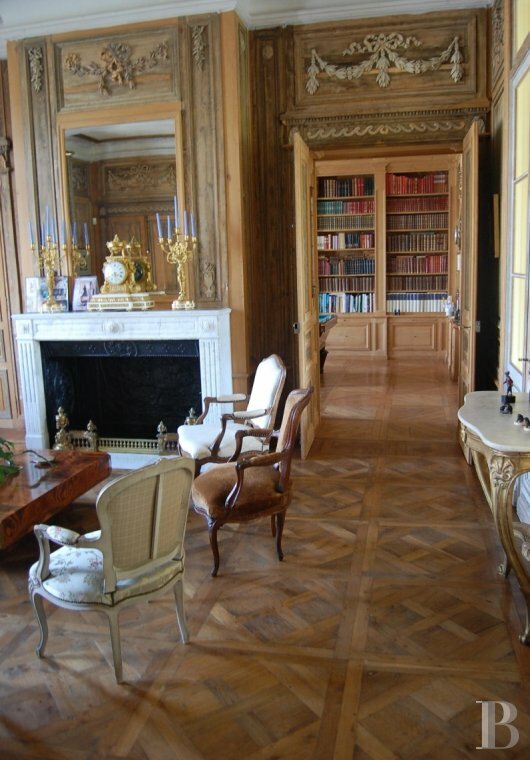 The herringbone pattern parquet flooring has been fully restored in accordance with traditional practices. 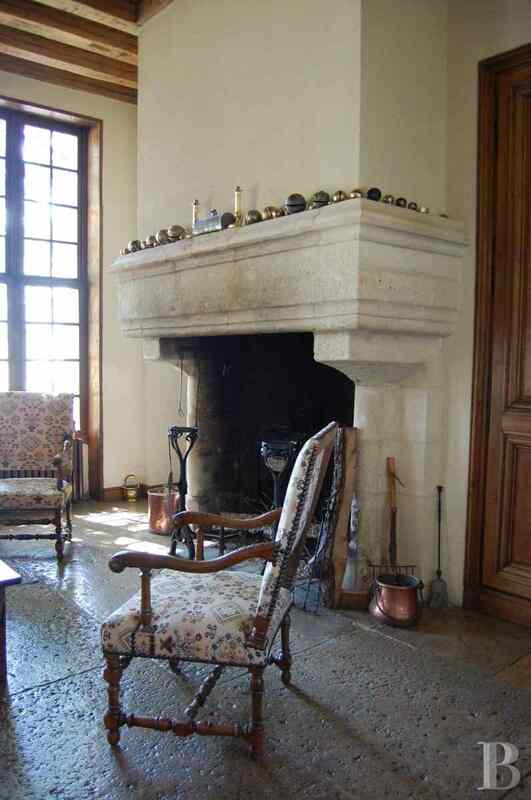 The lounge also features a white Carrara marble Louis XVI fireplace, topped with a trumeau decorated on either side by carved wooden fire pots. 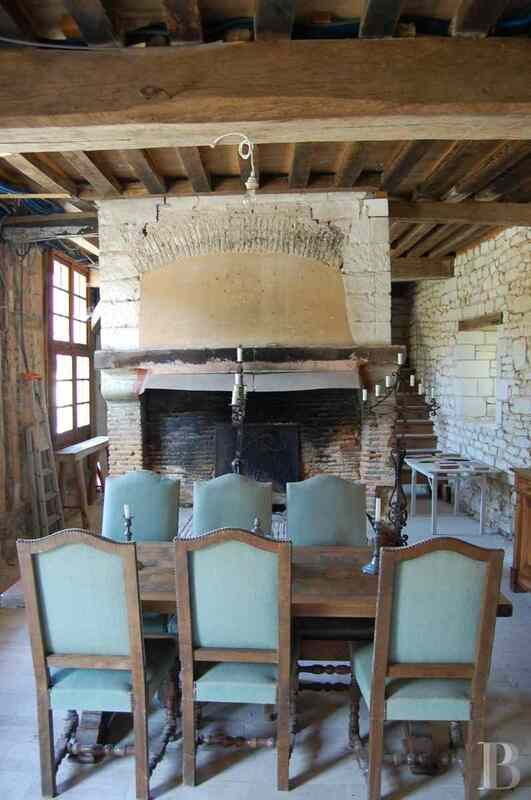 Two double, wooden doors on each side of the fireplace open into the small lounge. 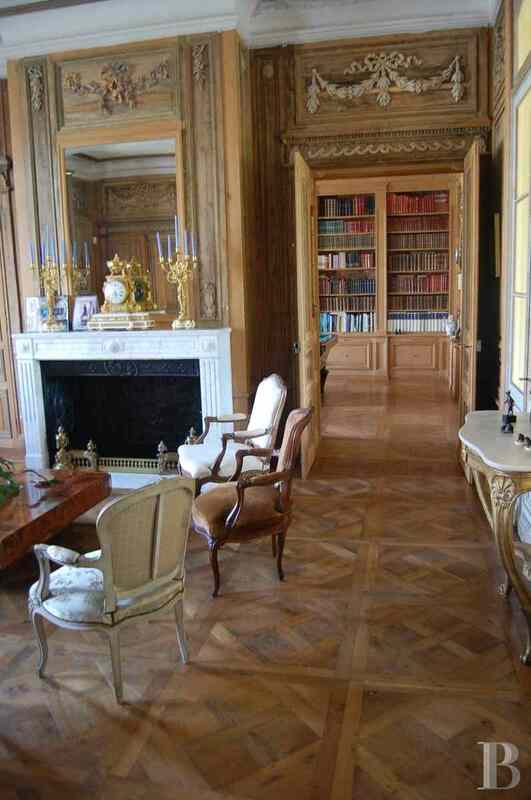 The parquet flooring is laid in a “Chantilly” pattern. 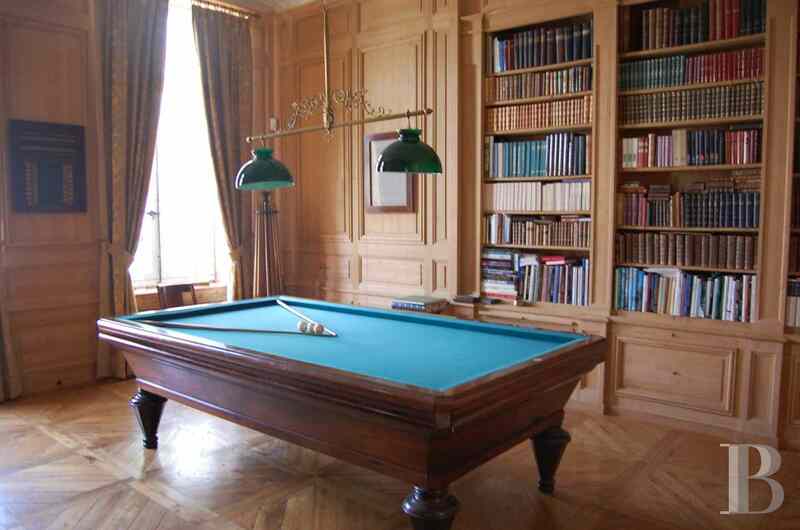 The walls are completely decorated with wooden panelling and lined with bookshelves. This room is currently used as a billiards’ room. 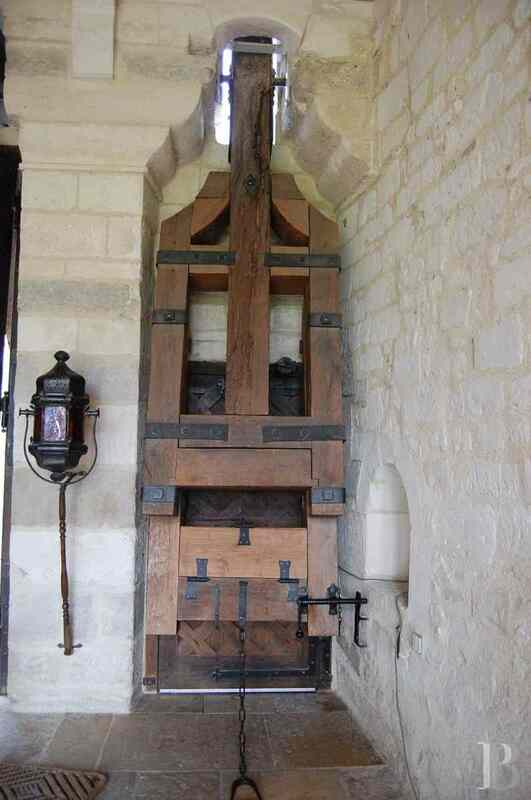 A concealed door provides access to a ladies’ sitting room which is in the 16th century tower. All the panelling has actually been numbered and dismantled so that it can be restored. A door leads to a toilet and a vestibule with a Burgundy stone floor which houses a second wooden stairway adorned with wrought iron railings. Next is a gallery with a Pompeiian-style mosaic floor. 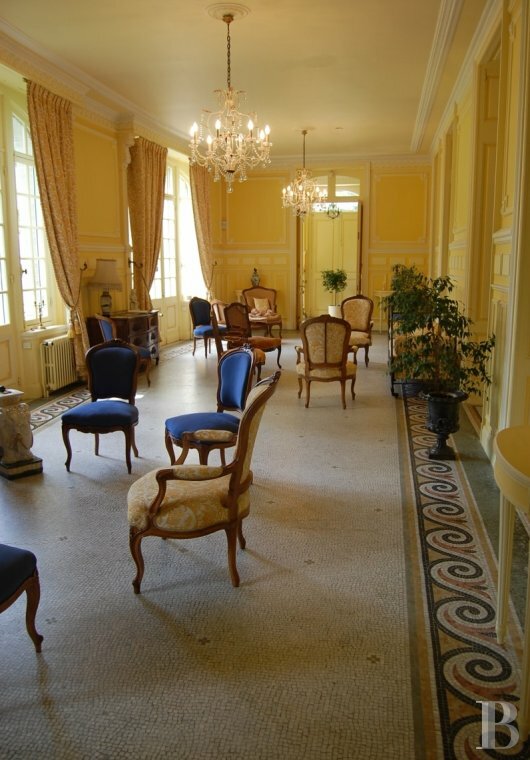 The walls adorned with panelling, painted in a pale yellow hue, are illuminated via light coming in through two large-paned windows, flanking the glazed door. The ceiling has a cornice featuring Greek motifs. This gallery provides access to the various ground floor rooms. 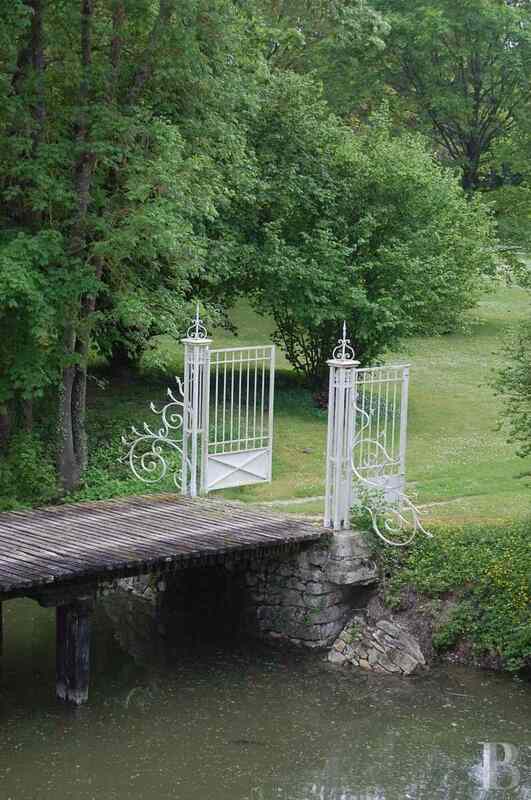 It is extended by a landing which opens on to the garden. 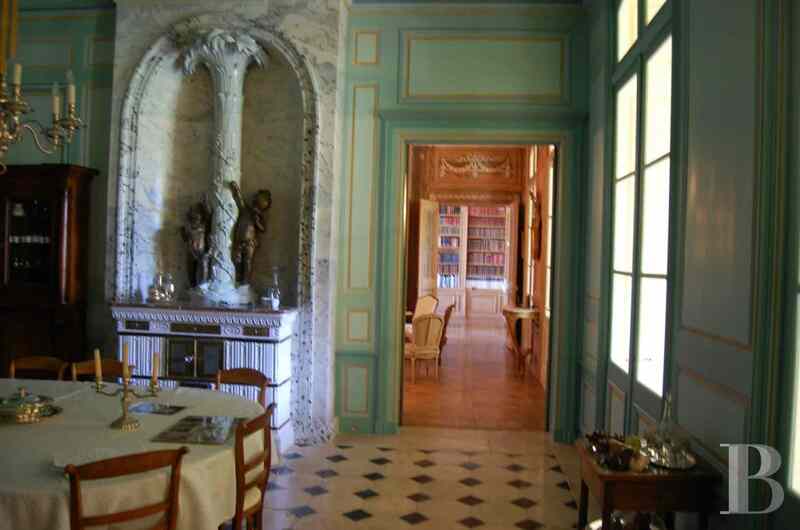 On the right-hand side of the entrance gallery, a door provides access to the 16th century section which comprises a dining room, with a stone fireplace and a Burgundy stone floor, as well as a fitted kitchen and a lounge with a stone fireplace. The wooden doors come from the Château-de-Vaux-à-Fouchères. The lounge opens on to a landing, decorated with an old washing boiler, which provides access to a cloakroom and a bathroom. 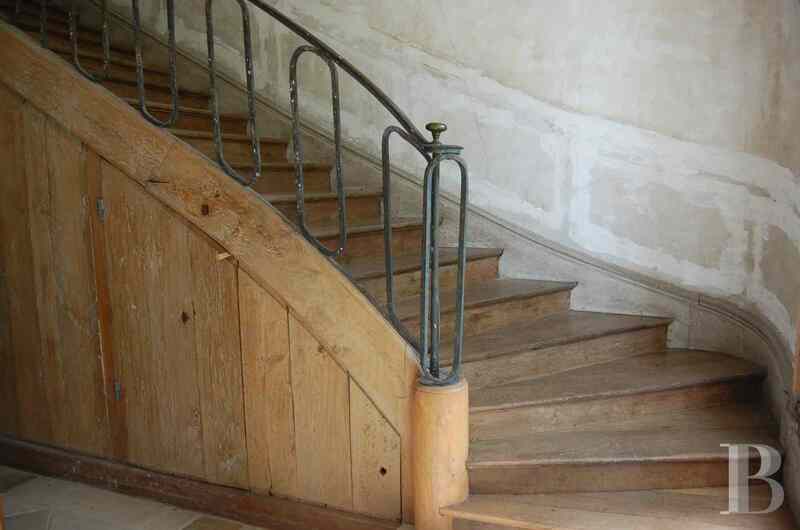 A second landing with half-timbered walls, houses a sand-blasted wooden stairway with wooden balusters. 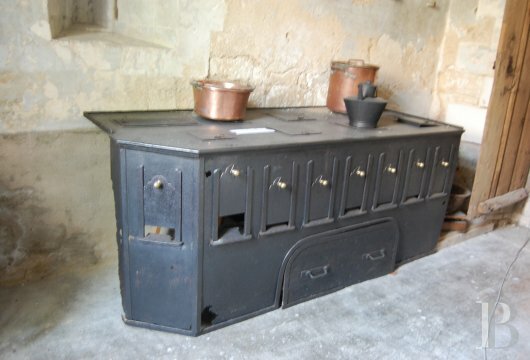 The old kitchen, still with its old bread oven, provides access to the fruit store and the vaulted wine cellar. 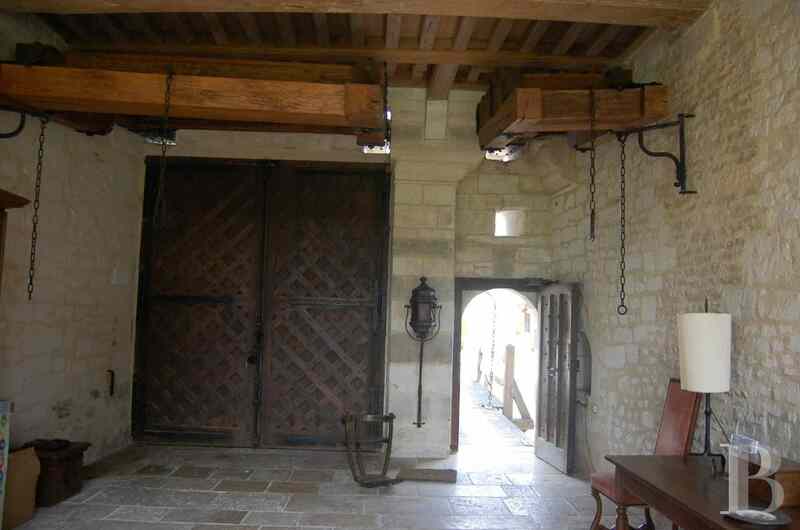 A door opens into the old stables and the adjoining old “charetterie”, where carriages were kept. 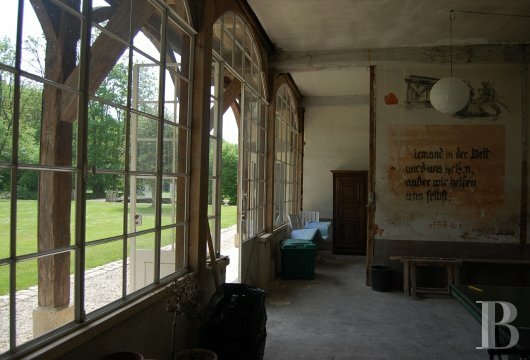 It has two picture windows and a glazed door leading to the main courtyard, in which can be see graffiti dating from the German occupation. The entire ground floor has been meticulously renovated in accordance with traditional practices. All three stairways lead up to the first floor. The main stairway in the 18th century section goes up to a landing where the terrace can be accessed. 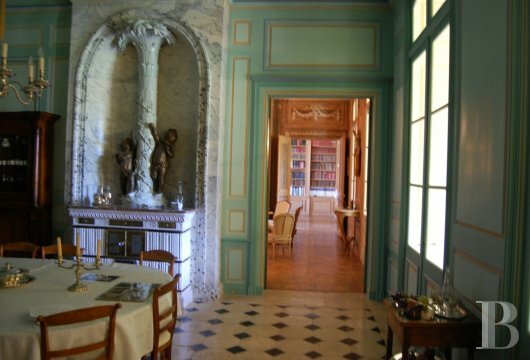 On the left-hand side of the landing, a corridor provides access to three bedrooms with marble fireplaces, panelling and parquet flooring, a study, a room in use as a storage room, a bathroom as well as a room featuring a marble fireplace which is in the corner tower. 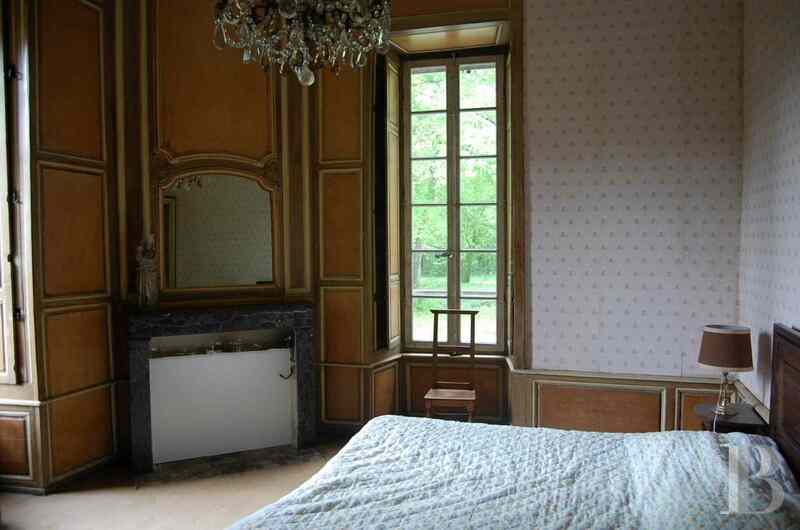 The panelling in this room has been fully restored. All these rooms have direct access to the terrace. This floor is accessed via the two 18th century stairways. 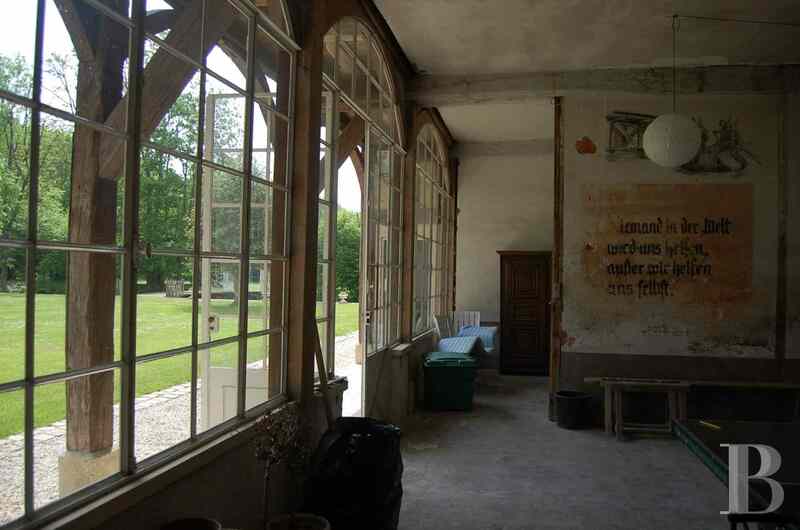 It comprises a through corridor, illuminated by windows set in the sloping Mansard roof, facing the main courtyard. Said corridor provides access to four bedrooms with sloping ceilings, panelling, marble fireplaces and strip pattern parquet flooring. Miscellaneous rooms are used as attic and storage space. 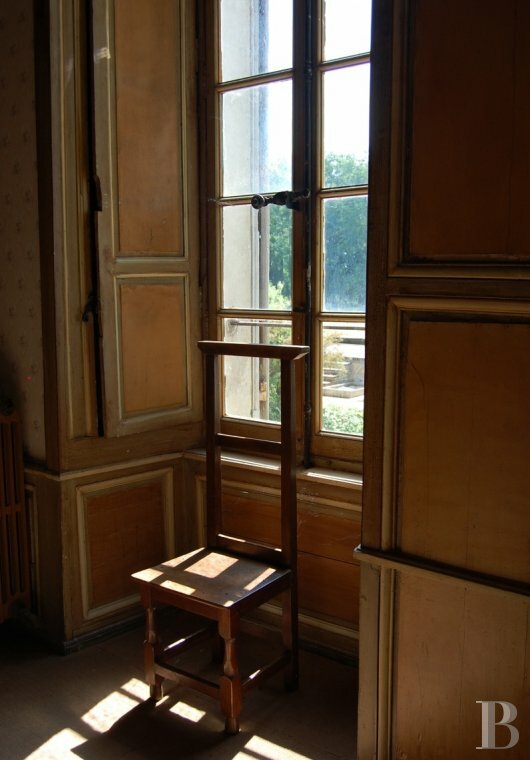 The living space is reached via a French window which opens into an entrance hall with a laundry room. This hall provides access to a dining room, featuring an alcove, and an open-plan kitchen as well as a stairway going down to the lower cellar. There are also a lounge, housing a wooden stairway with balusters, and a toilet. The stairway goes up to the first, mezzanine floor in the third tower, dubbed the Marchioness’ Pavilion. 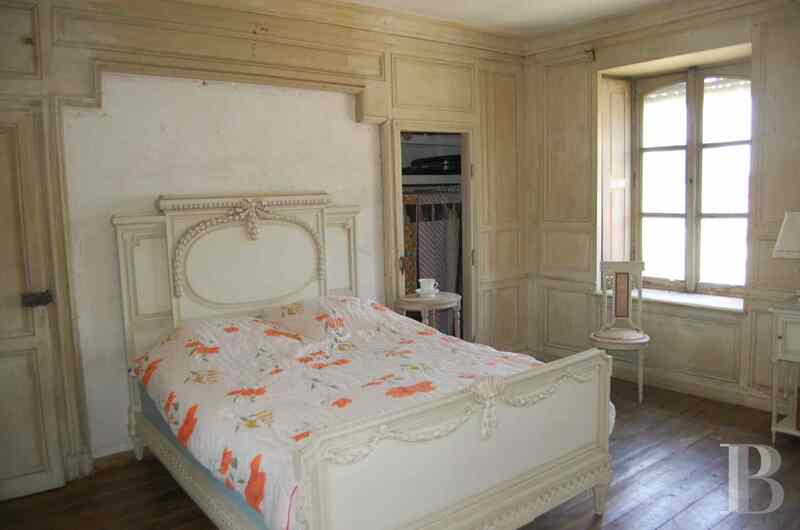 It comprises a landing, a bedroom with panelling and a black marble fireplace, as well as a recent shower room. 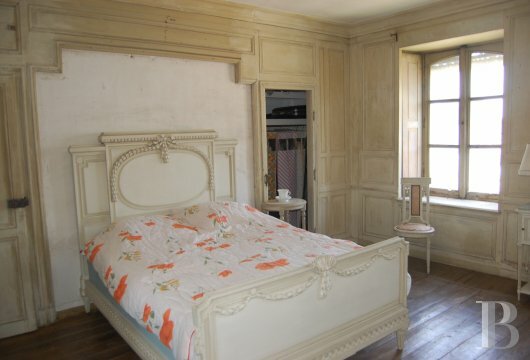 The first floor in the tower comprises a landing, a bathroom, a separate toilet as well as a bedroom also featuring panelling and a pink marble, corner fireplace. The floors are covered with strip pattern parquet flooring. 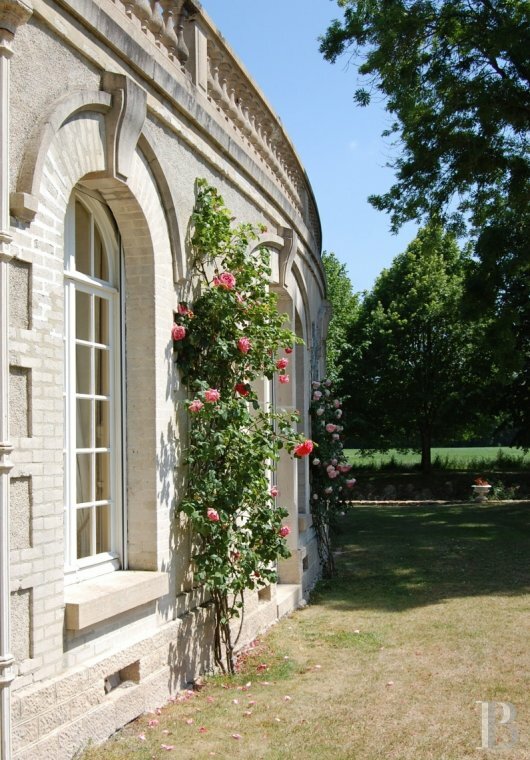 Accessed via the stairway, the first floor in the north-west wing comprises a shower room, a separate toilet as well as a central corridor that provides access to four bedrooms with sloping ceilings and strip pattern parquet flooring. 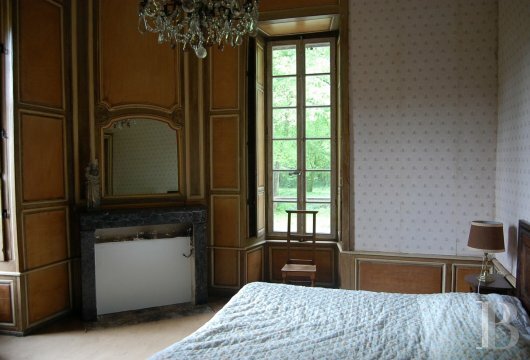 Each bedroom is illuminated via windows in the Mansard roof. One room is actually used as a storage room. 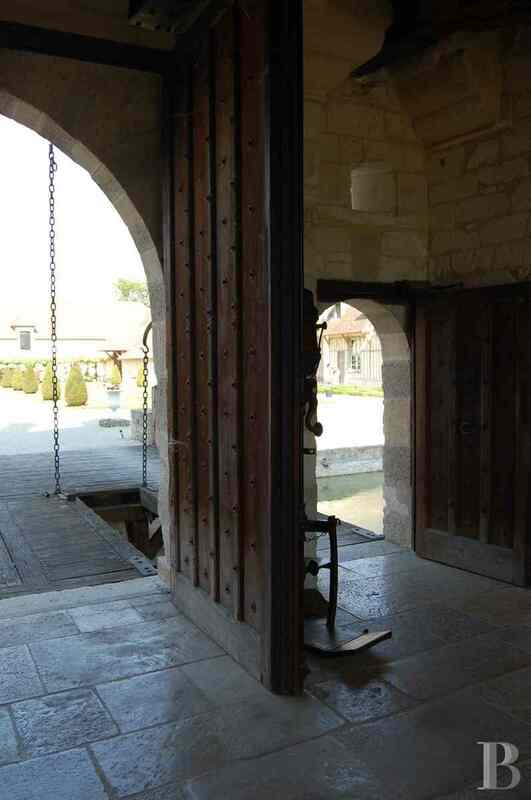 A door provides access to the converted attics which link this section to the rest of the castle. 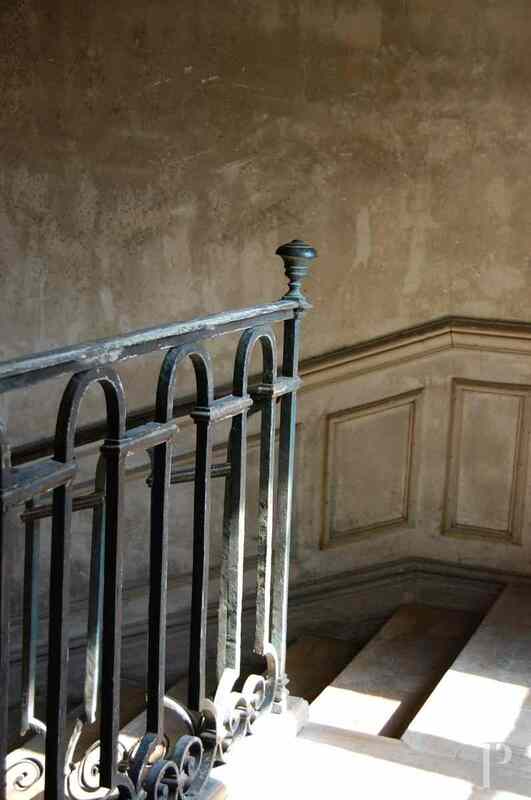 An outside stairway goes down to a vaulted cellar, closed by a wooden door, under the dowager Marchioness’ pavilion. 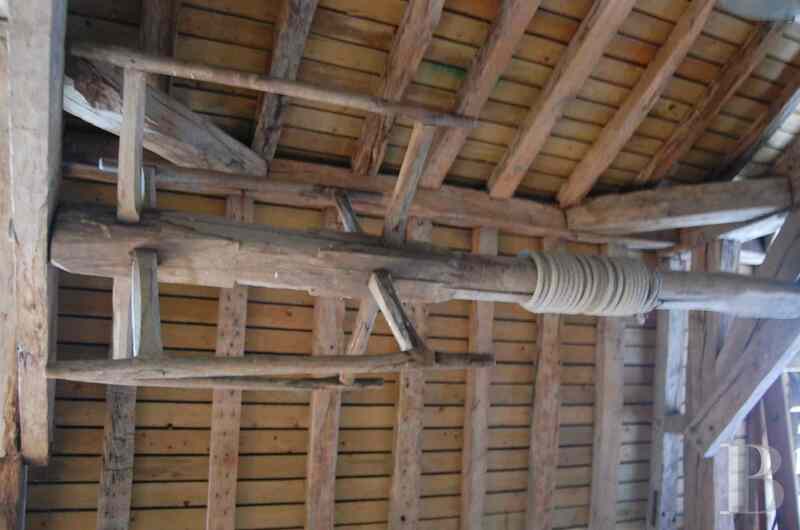 The heating system in the north-west wing is separate from the rest of the castle. The outbuildings are laid out in an L-shape around the outer bailey. 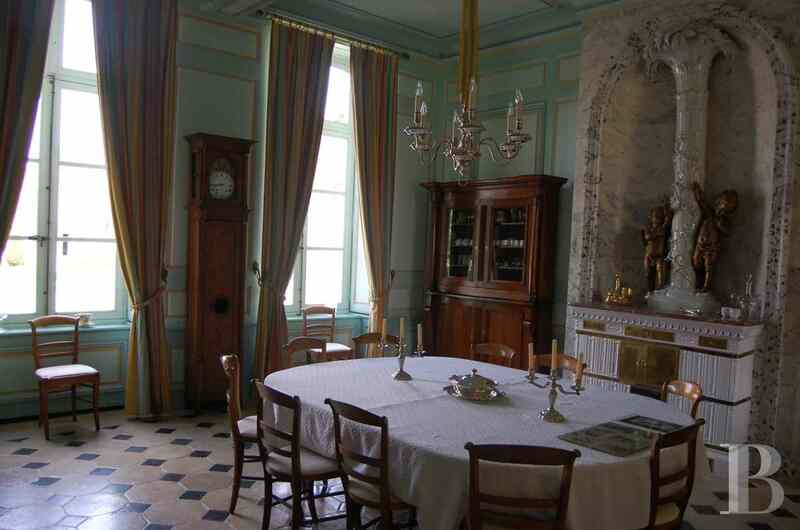 All the servants’ quarters have been meticulously restored. 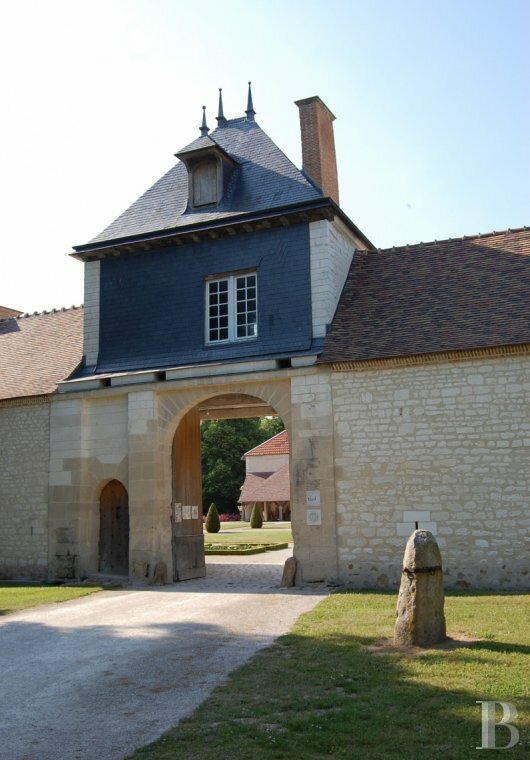 The gatehouse buildings span two levels and are topped with flat tile roofs, featuring four roof dormers with overhanging eaves, each of which is adorned with a zinc finial. The facades on the right-hand side of the entrance postern are composed of half-timbering and cob. Those on the other side feature exposed stone. 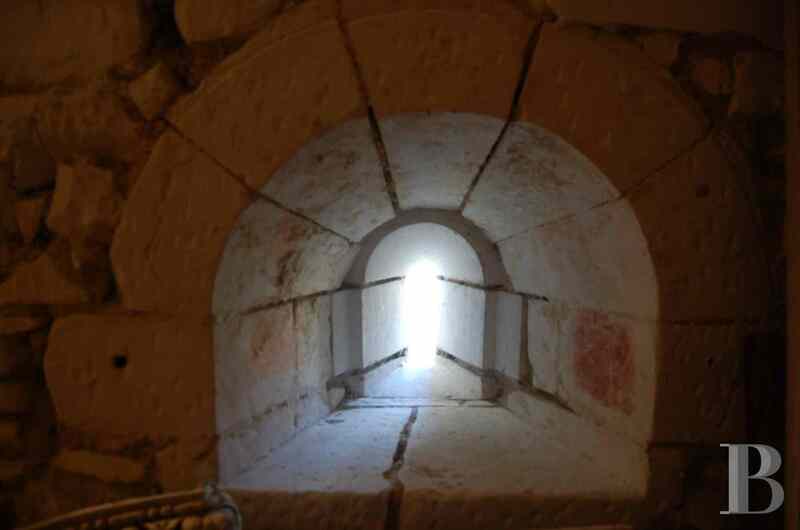 The entrance postern spans two levels. The first floor, with a mullioned window, is topped with a hip slate roof, featuring two zinc finials. The buildings comprise an old vaulted dairy, the floor of which is covered with terracotta tiles, and the old armoury, now restored and converted into a self-contained flat, comprising a living room, a kitchen with a stone sink, topped with a bull’s eye window, a bedroom and a bathroom. The floors are covered with stone tiles. 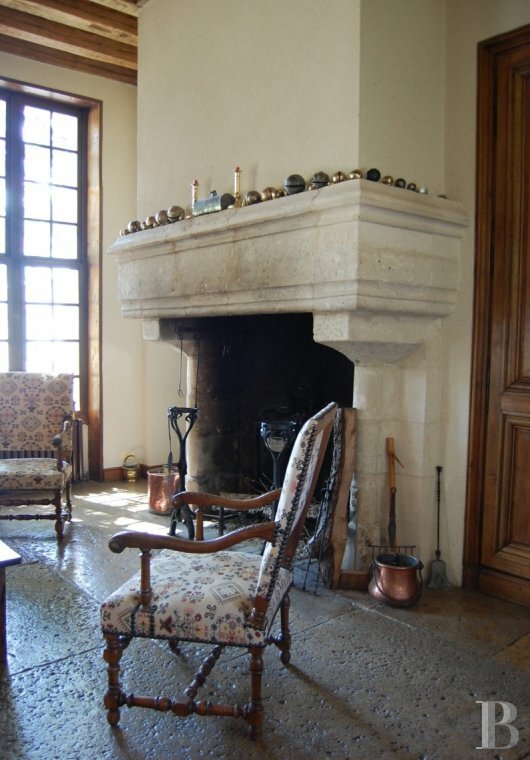 A guards’ room, accessed from the courtyard, has a double hearth, central stone fireplace providing heat for two communicating areas. 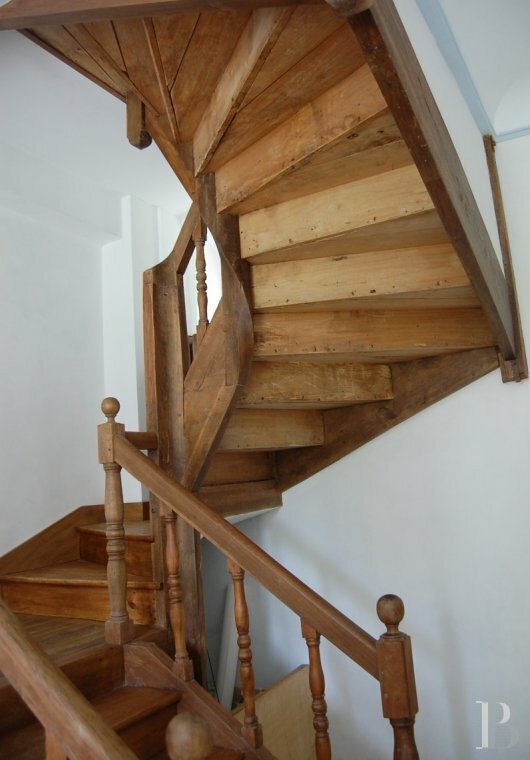 A wooden stairway leads up to an attic that could be converted. Following on from the miniature castle entrance are an exhibition room as well as a vast, 17th century barn with its exposed roofing framework and stone walls. 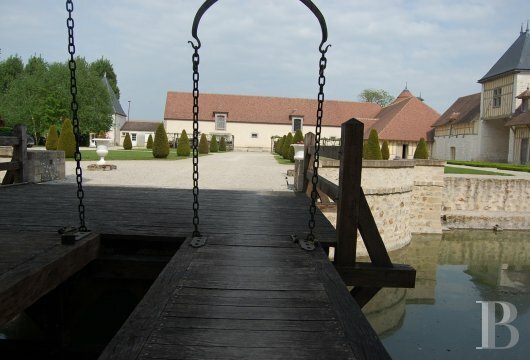 Set at right angles, facing the castle, is a barn, the first section of which is currently in use as a workshop. 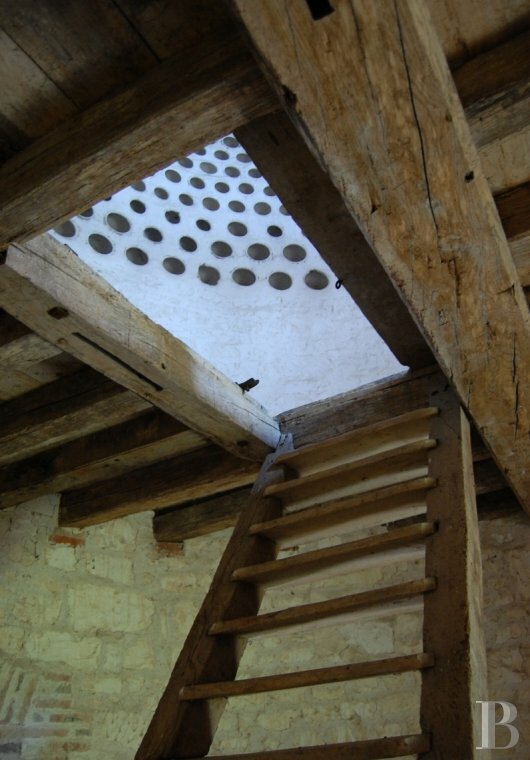 It is topped with an attic which can be reached via a wooden stairway. 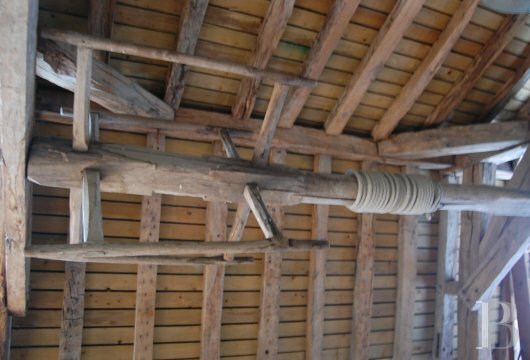 The second section of the barn, once the stables, is used as a storage area. There is also a woodshed. An ice cave, not currently accessible, stands on the other side of the lane leading to the castle. 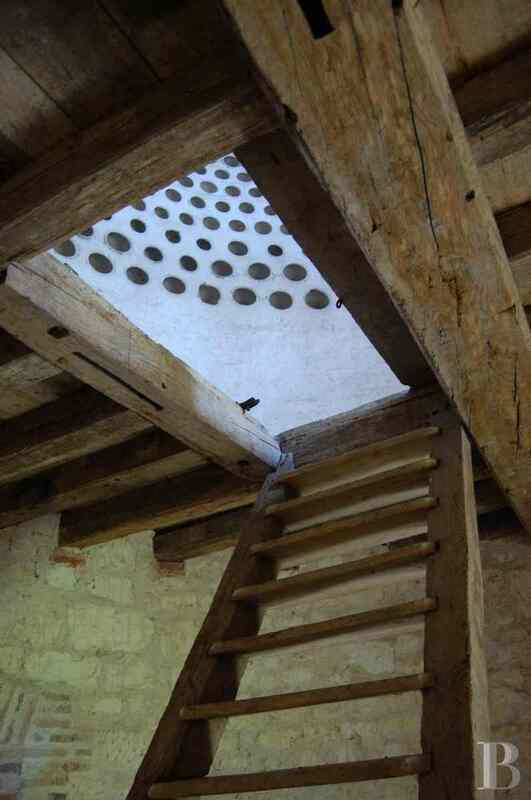 The dovecote, on the corner of the outbuildings, can be accessed from outside the courtyard. It is round in shape and is topped with a candlesnuffer roof covered with flat tiles. It includes a vaulted cellar. A stairway leads up to the first level as well as to the second level where, in the centre, there is a vertical beam that pivots on a hard stone locally referred to as “foire”. 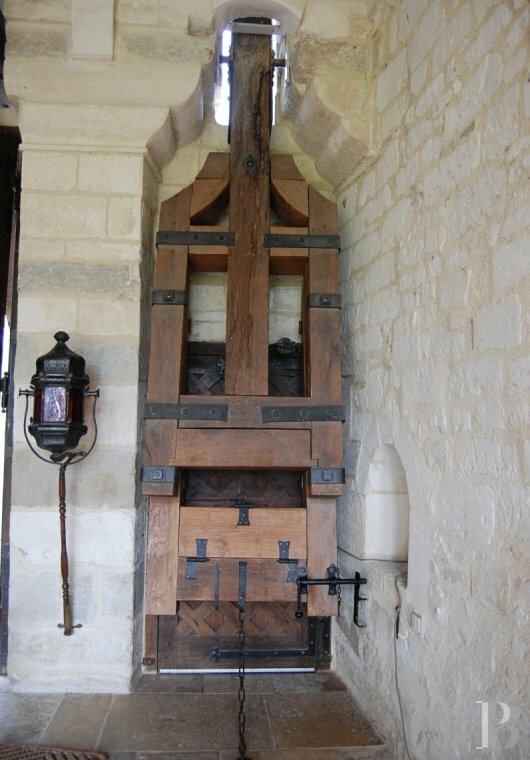 To this beam are attached the arms which are, in turn, connected to a ladder, the bars of which correspond to the different rows of dove-holes. This ladder made it possible to easily reach the dove-holes in order to catch hold of the pigeons or to clean out the nests. The parklands extend over approx. 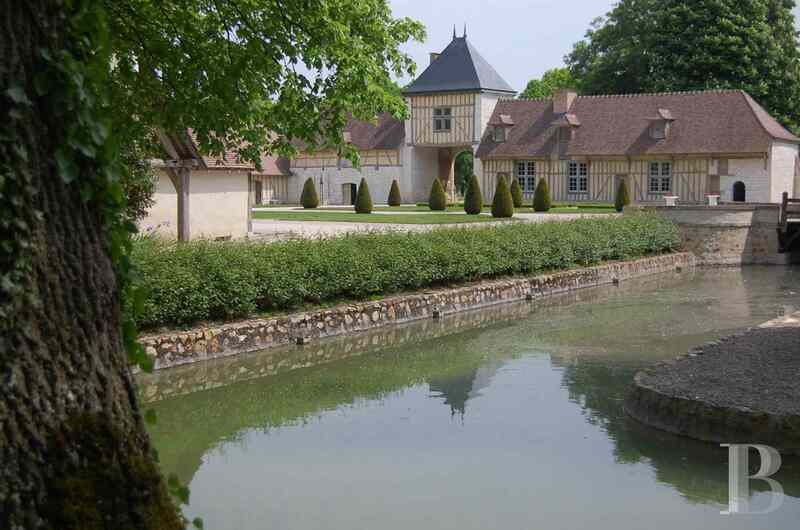 6 hectares, one third of which is woods and two thirds parklands, surrounded by water-filled moats. In the outer bailey, the French formal garden planted with yew trees, trimmed into a cone-shape, is next to the decorative vegetable garden, bordered by boxwood, reminiscent of the medicinal herbs and plants that were widely grown in the Middle-Ages in monastery gardens. 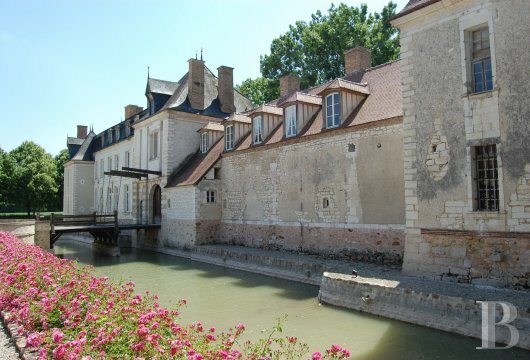 Once over the drawbridge, the main courtyard features a garden with medicinal and aromatic plants growing under the windows of the old kitchens. 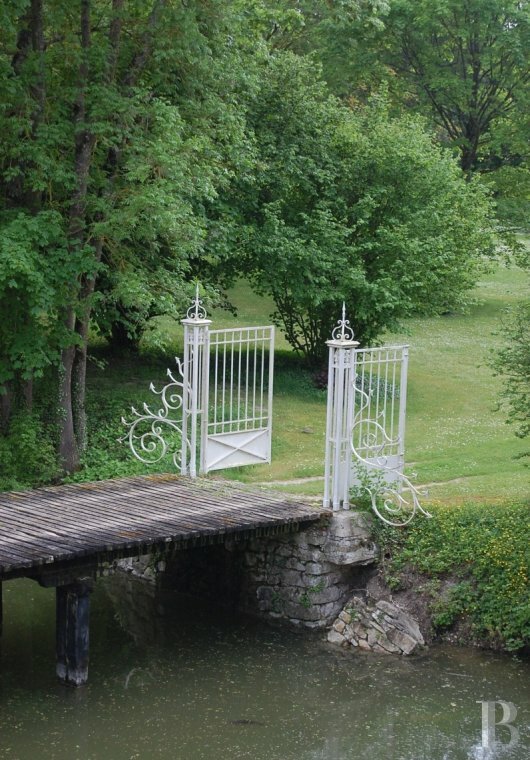 White wrought iron gates provide access from the castle’s main courtyard over a wooden bridge which spans the moat. 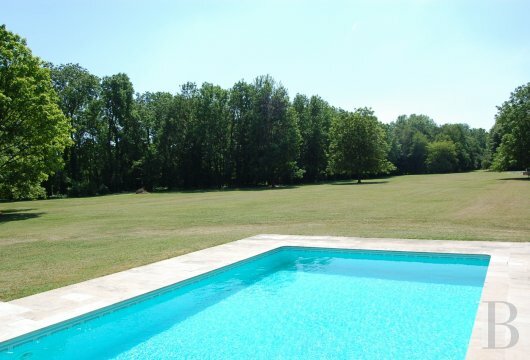 This leads to the rear of parklands comprising a large stretch of grass bordered by undergrowth. It is extended by the old alley of one hundred year old plane trees, of which only the stumps remain, but it is still possible to take pride in the view that it continues to provide. This “alleyway of the king” leads to the outer moat. The parklands also feature a swimming pool. 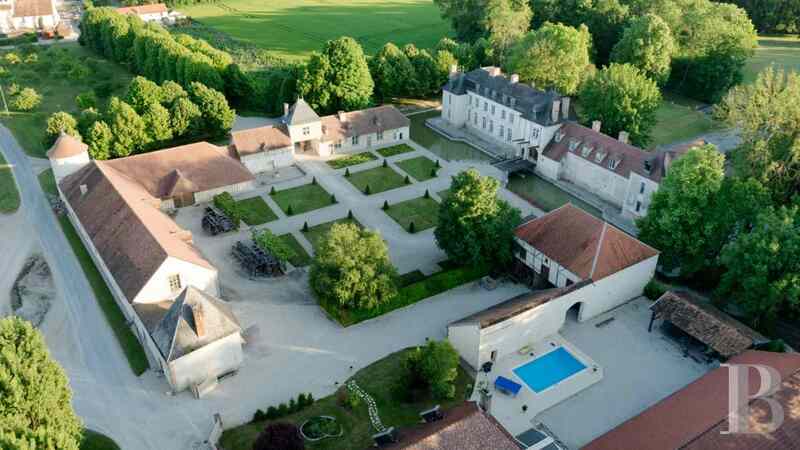 This building, once a fortress and now a chateau, currently reflects not only the elegance of the 18th century but also the rustic beauty of the 16th century. Standing in a nuisance-free setting, it still appears unassailable since it is surrounded by moats, but it can be accessed via the fully restored double drawbridge which stands out as the main feature of these premises, exuding their almost monastic serenity. 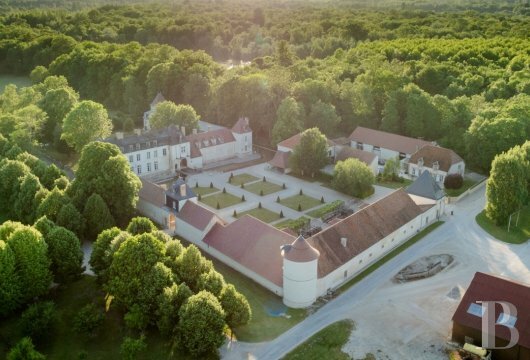 This castle bears witness to the enthusiasm of its current owners who, day after day for years, have zealously and meticulously, restored this unique property to its original condition whilst discreetly providing all modern-day home comforts. 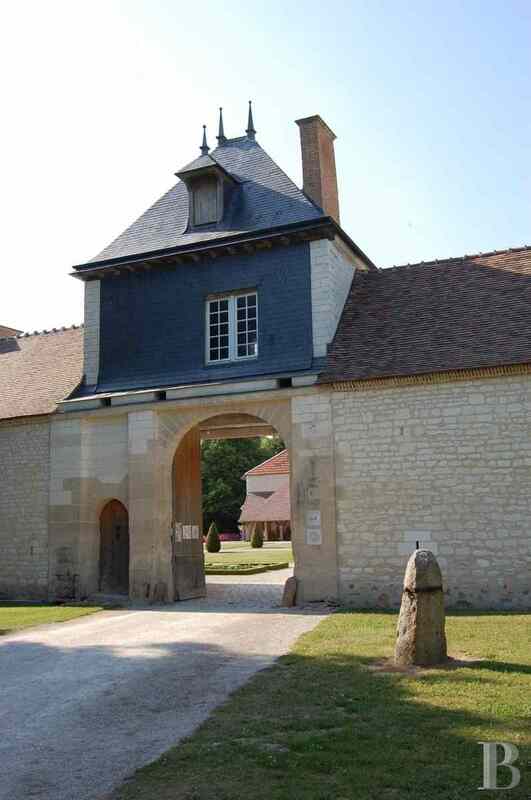 Restoration works which have received multiple grants and have led to its classification as a French Historic Monument, thus providing certain tax benefits. 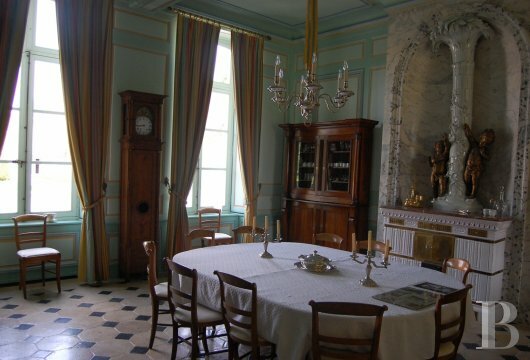 The inside of the castle is like a journey back through time: the centuries appearing to have been called upon to surprise, each leaving their mark and resulting in this unique composition. The future owners will have the honour of laying the “last stone”, of continuing the defence of the castle against the onslaught of time and of choosing from amongst the numerous uses to which this site, the pride of its region, could be put. 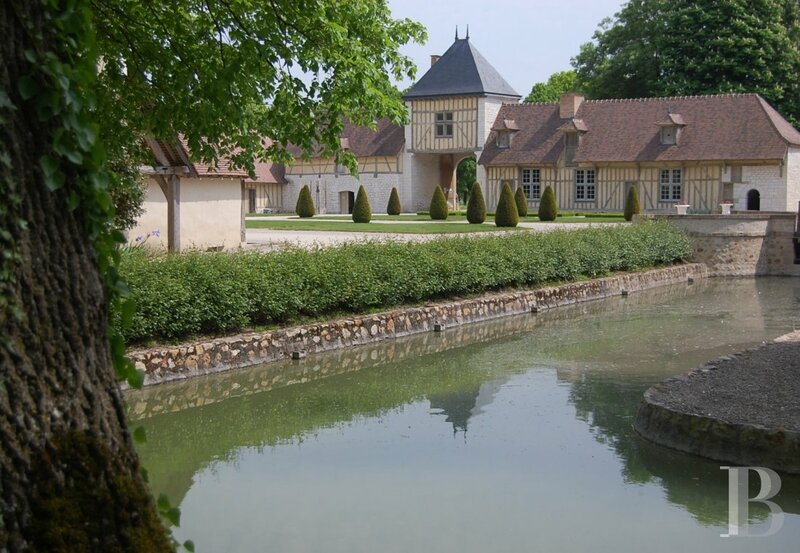 And for all that the fiscal aspect of its classification as a French historic monument will enable its new residents to greatly reduce or, even, eliminate their income tax.